Of all the games we got to try out at E3 this year, one stood out as having perhaps the least likely origin story: Culdcept Revolt. This 3DS title, published by Nintendo in Japan but brought Westward by NIS America, is the latest game in a series that started with a Japan-exclusive game for the Sega Saturn. Combining board game movement with the strategy and combat of collectable card games, it’s a unique mix, and one we were eager to try for ourselves. It took a while to get to grips with, but it was absolutely worth learning: Culdcept Revolt is an exciting, engaging card-and-board game that felt like nothing we’ve played before. Our hosts at NISA characterized Culdcept Revolt as “Magic: the Gathering meets Monopoly”, and that’s a surprisingly apt description — though for board game geeks, we’ll say that it has more in common with Settlers of Catan or King of Tokyo than Parker Brothers’ table staple. It’s an inherently competitive game, so you’ll either be playing against people — up to four players locally and online — or against the AI, and after a few helpful tutorials we went head-to-head against an early Story mode foe. 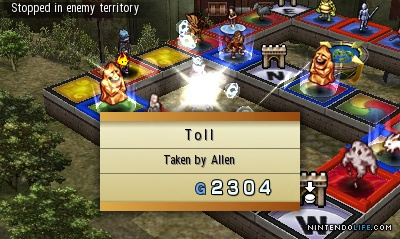 The basic flow of a Culdcept turn is as follows: First, you’ll roll a pair of dice to determine how far you’ll move along the looping board. Once you land on a square, you have a few options. One possibility is to summon a creature from the cards in your hand; creatures and spaces both have elements associated with them, and placing a Water monster on a Water (blue) tile, for instance, will grant a bonus to the monster’s stats. Another option is to ‘fortify’ spaces you’ve already conquered, spending energy points to increase the HP and attack power of the creatures guarding them. Why fortify these creatures, and why place them in the first place? 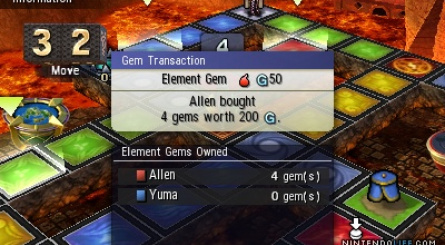 That’s where Culdcept’s battle system comes into play. 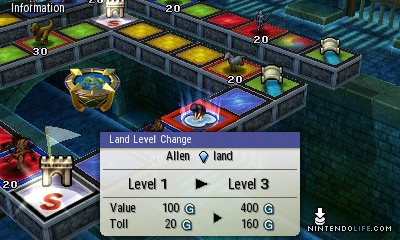 As you roll and move around the board, your opponent does so as well, and if they land on a square where one of your monsters has set up residence, they’ll have to either pay a (potentially hefty) toll, or fight for the square. In battle, the cards come to the forefront. If you land on an occupied space and choose to take up arms, you’ll select a creature from your hand, and pit it against the opponent’s. Helpful indicators will tell you whether your cards are weaker or stronger than the one you’re up against, but you can also add on extra attack or defense by playing weapon or shield cards before the battle. If you wipe out the opposing card’s HP completely, you’ll claim the space — but if not, your opponent maintains possession. These fights are mechanically straightforward, but we were really (and somewhat surprisingly) impressed by their visual spectacle. The colourful character design bears the signature of Kinu Nishimura — of Street Fighter and Code of Princess fame — and though the cards themselves are two-dimensional, the monsters within them come to life in lively, dynamic animations that fit their theme. One of our eagle-esque monsters attacked the other card by scratching it with a giant talon, actually drawing out ribbons from the virtual cardstock, and our adorably agricultural Cornmen dealt damage by slapping the opponent into submission with an enormous hand. The background for battle is selected by the element of the current space, as well, so we threw down cards in front of rolling seas and roaring fires, and the stereoscopic 3D effect makes the contrast between backdrop and card even better. The art on the cards themselves was another highlight of our hands-on time, and we were told the full game has around 400 of them. They come from a bevy of different artists, and the variety was always fun to see — when we drew a new monster we were just as excited about the art as its stats. Our NISA rep also stressed that all 400 of those cards are in the game to start, and though you’ll have to earn some of them for your deck building by playing through the game, there’s no pay-to-win option here; everyone has access to the same cards. That’s a refreshing change from many modern CCGs (Collectible Card Games), and should make online play a viable option for all players. Cards are more than monsters, too, and beyond placing or fortifying the beasts you can also use effect cards that can boost your team, nerf your opponents, or directly affect various parts of the board game. At one point in our match, for instance, our enemy played a card which turned our next roll into a guaranteed four — sending us directly into their most powerful monster. We thought we were done for, but our hosts pointed out we had a counter of sorts: a card that added an extra die to our roll. We played it on the start of our next turn, and with the third die unaffected by their dark, inconveniently timed magic, were able to breeze past the behemoth and set up our own trap a few squares down. Moments like that tactical tango were what had us most excited about Culdcept Revolt, because as fun as they were against the computer, we can’t wait to see what happens when we throw down against fellow sentient beings, and especially with four players at once. 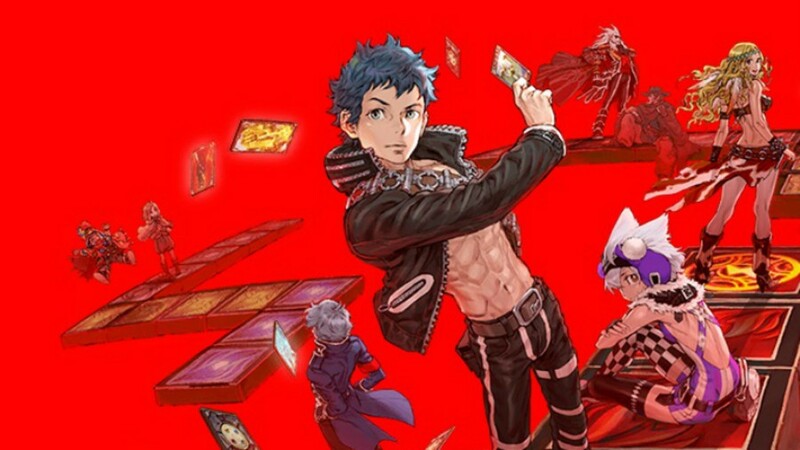 The combination of skillful deck-building, luck-of-the-draw and luck-of-the-dice, and strategic use of resources felt like a perfect package for friendly competition, and we can imagine having a ton of fun in Culdcept with friends and strangers alike. 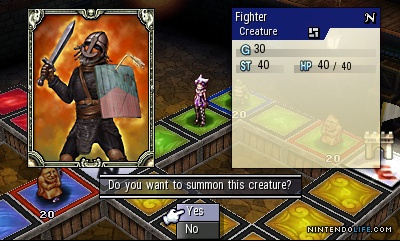 We’ll see how we fare when Culdcept Revolt launches on August 29th in North America, and September 1st in Europe. Might pick this up when I have no more 3DS games to play and still can't afford the Switch. i ordered the nice lookin CE because this game has a great look to it, and the gameplay reminds me of a GBA hidden gem Yugioh DDM. I think I'll get this; a shame it releases pretty soon after college starts up again, though. They actually localized the first game for the west on PS1 and then a later game came to the west on X360. It is an interesting game, particularly for those that like battling card games. I am looking forward to it because its the time of game that should work really well on a portable. This game looks really fun. But everytime I see the board, I keep thinking about Fortune Street. Damn. 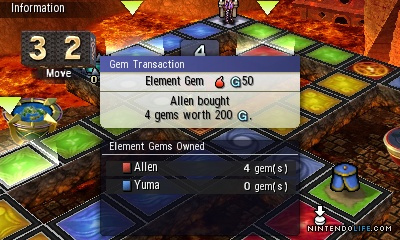 There's no way we're getting a new Fortune Street in the west, right ? So with the local multiplayer, are all the people able to play off one game cart or does everyone need to have a copy of the game? Basically, is it Download Play compatible? I have this game currently pre-ordered (special edition) but if it's not able to use Download Play, then I may cancel my pre-order because I don't see really anybody I know also buying the game. I played Culdcept Saga on my Xbox 360 for years - still get it out once in awhile. I have been so excited this game is coming out. If anyone is on the fence and enjoys a good strategy board game then you will love this game. I've watched one trailer before and wasn't sure what was happening. This article cleared things up and I'm now quite curious. It releases at a bad time though. I might get it if it is still able to pique my interest in September. Looking forward to this, I remember reading about some Yugioh game when I was a kid and being super interested. Does this have online multiplayer? Magic: The Gathering meets Monopoly? So... It's a high fantasy RPG card/board game hybrid that teaches the player about how capitalism inevitably destroys all except for one, and that socialism is much healthier for all involved? And thus the players must use their land cards to rebalance the distribution of wealth so only the monsters pay the ultimate price? With higher taxes, that is? If people are interested or on the fence, I would recommend taking the jump day one, if only because Culdecpt against real people is a great game, and matches are going to be harder to find as time goes on. I regretted not grabbing Culcept Saga on release because by the time I got it the online (over a year later) community was mostly gone. Historically it's been a limited print titled and gets hard to find fast. If it doesn't click, it should hold it's value or even appreciate if you sell it privately or at auction. The original PS2 game wen't for 70-90 dollars (USD) almost immediately upon release. @QuickSilver88 First Culdcept in the West was on PS2. @ShadJV Not in any particular mechanics at all! I just meant, people who play board games and find Monopoly too simplistic shouldn't be scared away by the Monopoly comparison — the card component gives it a lot of strategy in the way that Eurogames (like Catan but also Dominion, Ticket to Ride, etc.) have! Def nothing specifically about it that's like Settlers! @zipmon thanks for the clarification! Initially it looked to me like the Command Board mode from Kingdom Hearts Birth by Sleep (which may have just been based on Culdcept). As a board/card game enthusiast this does have my interest! looks at backlog ....I'll just go cry in a corner now. I loved Culdcept on the PS2. Only one problem. Games could last hours and you couldn't save in a game. You had to make sure you had a really long block of time set aside before each playing session. I hope this isn't the case this time. So glad this is finally coming over on portable, that seems like a perfect way to play! We've played some of the older iterations and enjoyed them. A very fun strategic game.